WARSAW: A knife-wielding assailant stabbed the mayor of the Polish port city of Gdansk in front of hundreds of people at a charity event on Sunday, leaving the politician fighting for his life. Video footage showed the attacker bursting onto the podium and launching himself at Pawel Adamowicz, 53, who had been waving sparklers on stage along with others at the evening fundraiser. After knifing the major several times, the man turned to the crowd with his arms raised triumphantly but was quickly apprehended by security guards and arrested. Paramedics resuscitated Adamowicz at the scene before rushing him to hospital where he underwent surgery. "There is hope but his condition remains serious," Polish President Andrzej Duda said on Twitter, adding that Adamowicz was alive but "gravely wounded". A Gdansk police spokesman said the detained man was a 27-year-old who lived in the city. "That´s why Adamowicz dies," he said before being knocked down to the ground by security. 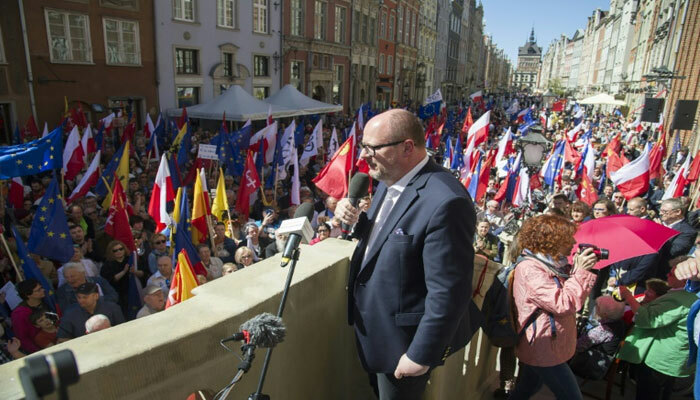 Adamowicz has been mayor of Gdansk, whose population numbers around half a million, for two decades and the Civic Platform had supported his re-election in 2018 municipal elections. Sunday´s event was part of a national drive to raise funds for the purchase of medical equipment and featured a colourful stage set-up including lights, smoke and pyrotechnics. According to Polish media, the suspect had been sentenced to more than five years in prison for four armed attacks on banks in Gdansk. Police were investigating how the attacker had been able to breach security to reach the podium, Gdansk police spokeswoman Joanna Kowalik-Kosinska told reporters. "We know that he used an identifier with the inscription ´Press´," she said. "Now we have to establish how was it obtained, was the accreditation in his name and was he really entitled to be there at that time?" The director of the hospital in Gdansk where the mayor was taken, Jakub Kraszewski, told reporters just before midnight local time (2300 GMT) that surgery was underway. "He is in a critical condition... we are battling to save him," he said.